We couldn’t have asked for better Farm Trails weather last Sunday. It was a beautiful spring day and we encountered plenty of blossoms, bees, and babies along the way. Out of the more than eighteen farms participating we managed to visit four, each one providing a unique experience in farm life and local products. 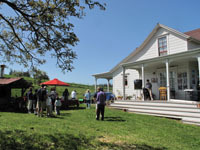 In the morning we experienced the union of Olympia’s Apple Orchard at Two Rock Ranch and the Tresch Dairy. This was provided in the form of a tasty apple crisp served hot from their outdoor oven and slathered with a scoop of Straus Family Creamery ice cream. Tresch is one of only three dairies that supply milk to Straus and was the second dairy in California to be certified organic. Olympia’s Apple Orchard is home to some 50 varieties of apples from their 500 apple trees. The valley where the orchard and dairy reside is cozy and utterly beautiful. Some of the Wernher Krutein photos displayed across the porch of the imposing Victorian farmhouse depicted idyllic landscapes of the properties that would make the most committed city dweller yearn to live in the country. The mascots for the day were three baby calves corralled in a ring of hay bales. 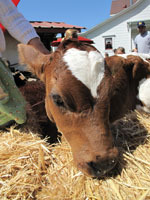 There was one spunky little red Holstein that stole the show, soliciting head pats and sucking on available fingers. We left with our tummies full and a recipe for apple crisp tucked in my back pocket. Farther up the road we stopped in Valley Ford at Sky Horse Ranch where we learned about Equine Guided Education (EGC) and I found a new pillow. The drive up to the top of this property was worth the visit alone. The views were spectacular; rolling hills as far as the eye could see. Through their EGC programs Sky Horse Ranch uses horses to help people improve their self-confidence, build better relationships, and become better leaders. With their organic wool bedding they are helping people get better sleep. I’ve used my new wool pillow for the past two nights and I am already hooked! It was very soft and had nice resilience. The wool is also non-allergenic and mildew resistant. I need more time to tell for sure but I may be giving up my down pillows. In the late afternoon we squeezed in a couple of more visits to two farms in Petaluma where there were babies in abundance. Barlas Boer Goats had a corral of friendly moms and “kids” available to pet and feed as well as an adorable baby donkey. At Tara Firma Farms we saw dozens of itty bitty chicks, bigger bitty chicks, and a hoard of little piggies. We just started to get a handle on their impressive sustainable farming practices when the day came to an end. We’ll definitely be back for a longer visit! The seasonal Farm Trails Days are a great way to get to know our farming community and the important ways they support us with food, products, and services. Some farms only make themselves available on these special days but many farms are open year-round, seasonally, or by appointment. 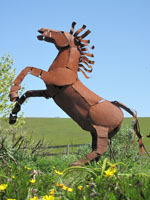 Check out www.farmtrails.org and create your own farm experience. Whether you’re looking for bee keepers, butchers, veggie farms, nurseries, dairies, or free range eggs, you will find them and more! Thank you for coming out and supporting local farms and then going home and writing about your experience. Our goals at Farm Trails are to be the connection to buying direct from the farm and building public awareness of the benefits to eating locally. This, our first Weekend along the Farm Trails Spring Event brought over 300 car loads of people out to the farms, what a great success! Thank you to Suzanne Alexandre, our Special Event Coordinator for organizing such a wonderful event.